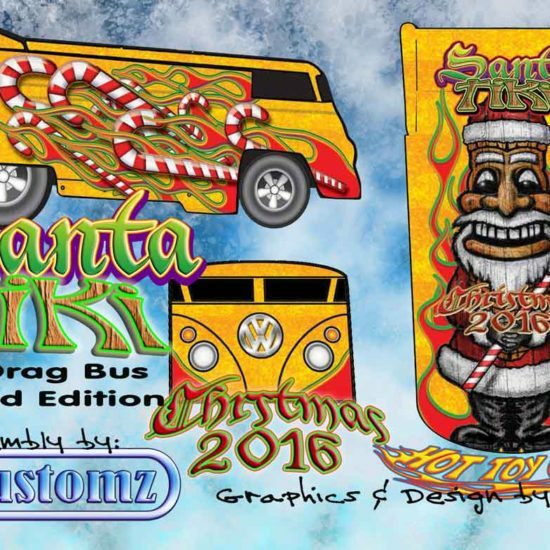 Home / Custom Diecast / Special Promotions / Santa Tiki VW DRAG BUS 2016 – LB Customz/Okie Logo Tag Team EXCLUSIVE!! 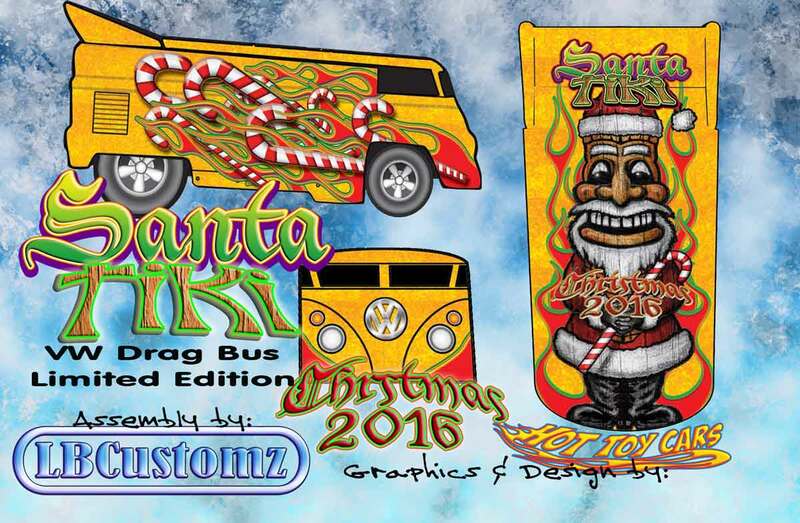 Santa Tiki VW DRAG BUS 2016 – LB Customz/Okie Logo Tag Team EXCLUSIVE!! This is a LIMITED QUANTITY, “PRE SALE” item. The total items available to purchase is limited to ONLY 10 !! the products are still in production stage at time of sale and will ship at a delayed time. Photos shown within this listing are concept, in process images and with the exception of painted examples, may vary from final product slightly. THANK YOU for your purchase AND your patience!! 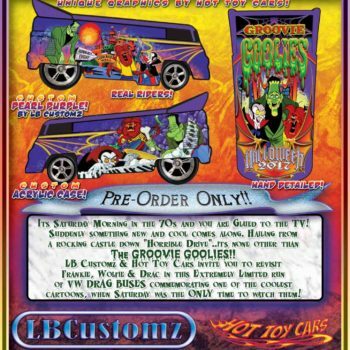 Another team up of world renown professional customizers brings you this Original Art EXCLUSIVE Dairy Delivery Limited Edition!! 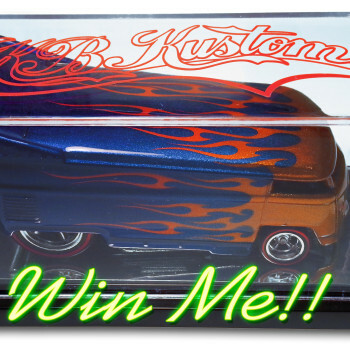 Features brand new, HAND Drawn Character design from Okie Logo (KB Kustoms official design company) and the masterful paint and assembly of LB Customs (Dino Laspada) who are both members of the Diecast Hall Of Fame btw!! We had to be a little “different” …not just a traditional santa or candy canes here!! Nope, some may think of snow, but, we had something a little warmer in mind…lol Whats more “tropical” than a “tiki”? 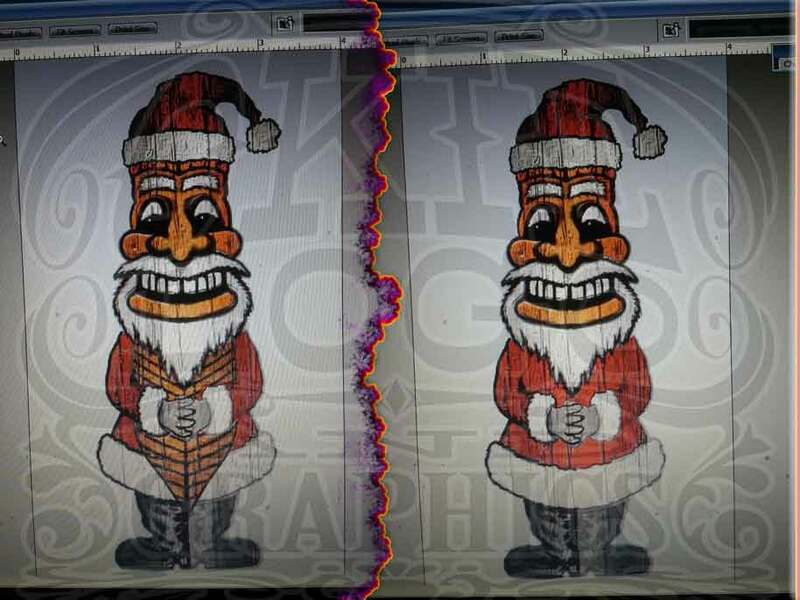 I dont know, but that is what inspired KB to combine the elements of the Traditional Jolly Ole Saint Nick and a weathered wooden tiki you might see on some tropical island! 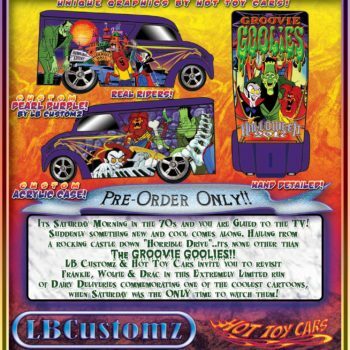 This is a unique design only found on this exclusive edition. And again, this is a NEW..HAND DRAWN artwork character! You wont find this floating around the net or used on someone else’s Christmas dairy from 2, 10 or 20 years ago! Yep, KB sketched the concept out by hand and then used multiple photoshop layers and textures painstakingly tweeked and refined to create the Santa Tiki character who appears to be previously brightly painted but has had to endure many years of the elements, (that darned old “open sleigh” no doubt! lol) and is now slightly dingy, off white and faded red, with ever widening woodgrain cracks through out his Candy Cane holding jolly self!! 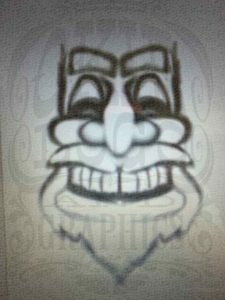 Then as only a true automotive enthusiast would have it..Santa Tiki just HAD to have some FLAMES!! But, these flames have a Christmas flair with red and green colors to match the season. When have you ever seen those two things together?? Not often I venture! KB had that stuck in his head from the inception of this design and figured a way to pull it off without being just some red and white stripes over flame shapes! 33 seperate layers of flames and scratch created candy canes were intertwined to get just the right look and balance for the sides!! 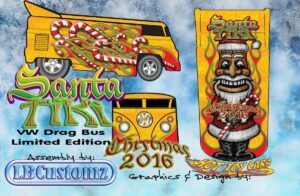 And this design for the side of the Drag Bus, got a few extra flames and candy canes too!!! 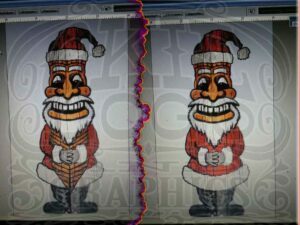 Dino suggested this BEAUTIFUL CANDY GOLD and its extremely sparkly Orion Silver base gives just the right “twinkle” to ol Santa Tiki’s eye!!! Dino also adds his masterful details to the lights and grill. Seals it up with generously applied 2 part Urethane Automotive Clear!! Candy Gold over Orion Silver 2 stage color. Automotive Urethane 2 part Gloss Clear. 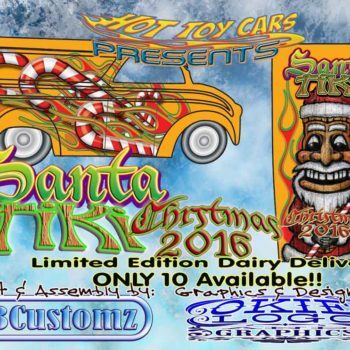 Santa Tiki Dairy Delivery 2016 – LB Customz/Okie Logo Tag Team EXCLUSIVE! !